Influence on Twitter can be measured in a variety of ways, but one of the most interesting for marketers is in the amount of traffic an account can send to a link it Tweets. Months ago, when I was working on clickthrough rate (CTR) data I noticed that the CTRs from highly followed celebrity accounts varied greatly, so I graphed the data. 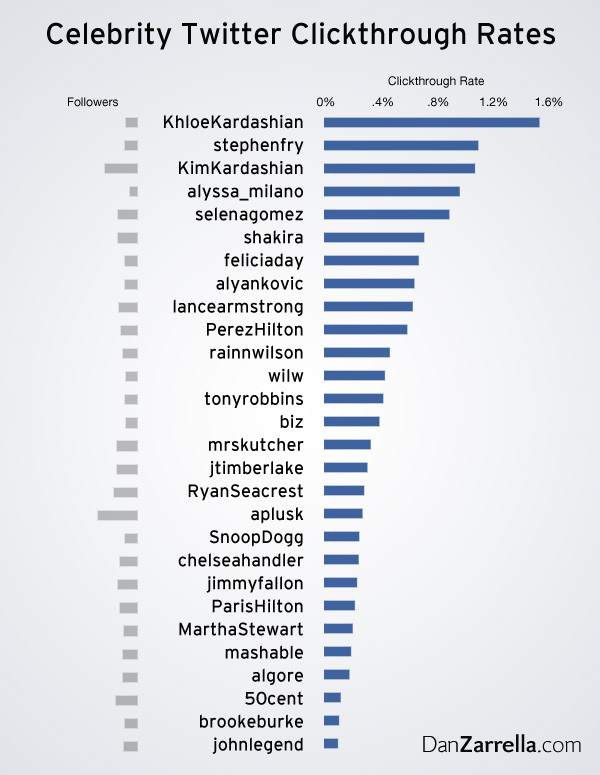 Below are the celebrities for whom I’ve been able to analyze at least 100 links shortened through the bit.ly service. I define “clickthrough rate” as the average number of clicks on the links they Tweeted divided by the number of followers the accounts had. Got a favorite celebrity? Want to Tweet about their clickthrough rate? Introducing a New Kind of Tweetup: Social Media Battles Which is More Powerful: Social Proof or Social Pioneering?